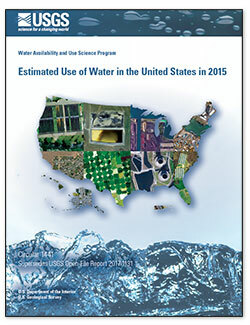 The Water Use Science program is responsible for compiling and disseminating the nation's water-use data. Regional Groundwater Availability Studies develop the understanding to assess and quantify availability of the Nation's groundwater resources. 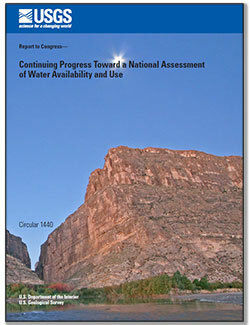 The National Water Census develops new water accounting tools and assesses water availability at the regional and national scales. Cooperative matching funds are used to monitor and assess water resources in partnership with nearly 1,600 local, State, and Tribal agencies. The Water Availability and Use Science Program (WAUSP) assists in the determination of water that is available for beneficial uses, now and in the future. This includes evaluating the quantity and quality of water, identifying long-term trends in water availability, and developing an improved ability to forecast the availability of water for economic, energy production, and environmental uses. Evenson, Eric J.; Jones, Sonya A.; Barber, Nancy L.; Barlow, Paul M.; Blodgett, David L.; Bruce, Breton W.; Douglas-Mankin, Kyle; Farmer, William H.; Fischer, Jeffrey M.; Hughes, William B.; Kennen, Jonathan G.; Kiang, Julie E.; Maupin, Molly A.; Reeves, Howard W.; Senay, Gabriel B.; Stanton, Jennifer S.; Wagner, Chad R.; Wilson, Jennifer T.
Evenson, E.J., Jones, S.A., Barber, N.L., Barlow, P.M., Blodgett, D.L., Bruce, B.W., Douglas-Mankin, K., Farmer, W.H., Fischer, J.M., Hughes, W.B., Kennen, J.G., Kiang, J.E., Maupin, M.A., Reeves, H.W., Senay, G.B., Stanton, J.S., Wagner, C.R., and Wilson, J.T., 2018, Continuing progress toward a national assessment of water availability and use: U.S. Geological Survey Circular 1440, 64 p., https://doi.org/10.3133/cir1440. 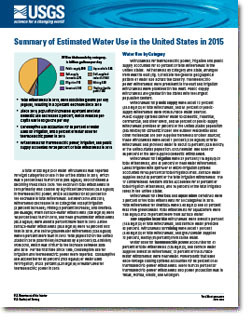 Dieter, Cheryl A.; Maupin, Molly A.; Caldwell, Rodney R.; Harris, Melissa A.; Ivahnenko, Tamara I.; Lovelace, John K.; Barber, Nancy L.; Linsey, Kristin S.
Maupin, M.A., 2018, Summary of estimated water use in the United States in 2015: U.S. Geological Survey Fact Sheet 2018-3035, 2 p., https://doi.org/10.3133/fs20183035.